I love the pattern, color and density of this rug. I sent back the 5x8 for the 6x9, but it is not that much larger, not 12 inches either way larger, but I am very happy with it. I also bought a 2x3 for the back door. 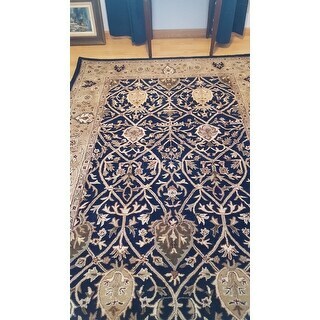 An intricate Oriental design and dense, thick pile highlight this handmade rug. The rug uses designs from timeless masterpieces combined with the finest New Zealand wool to create one of the finest handcrafted rugs available. 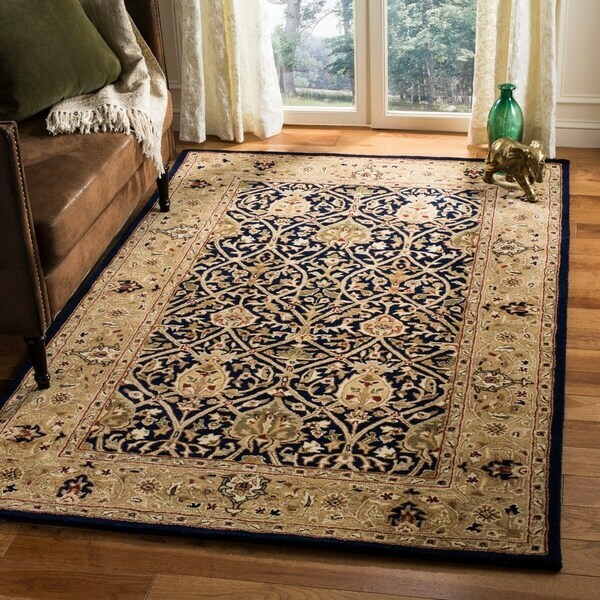 This floor rug has a blue background and a gold border and displays stunning panel colors of blue, green, beige and red. Liked so much I bought more! We have an open plan so I got a runner for kitchen, small for the back door and a larger one for living area. Ties everything together nicely. Expect the rug to shed, it is wool, and wool rugs do that. After time it will stop. The "gold" color is more of a cream colored gold, very pretty. It is a beautiful patterned rug and I do recommend it. I was very wary of buying a rug on-line, especially seeing the reviews regarding other rugs. However, this rug is NOT hand tufted, so it does not fall apart and shed ridiculously. Thank goodness for another review on another rug advertised on Overstock which explained WHAT to look for in a rug... "hand made" in any context seems like a good idea, but being hand tufted is clearly not. Thank you for the honest reviews of other buyers; they help all of us. 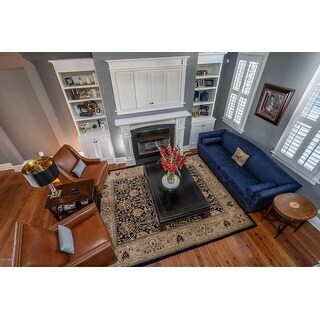 Excellent price; nice rug; color not even close. I'm content. This is a true navy rug. The colors in it are navy, olive, beige, ivory, sage, and chocolate. The three colors you notice the most are navy, beige, and olive. I am very impressed with this rug. It is a very high quality rug and is very much an "impact piece". No gold in this rug! 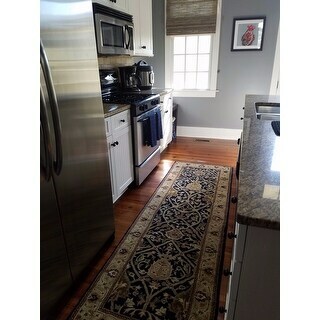 This rug is fantastic, but it looks absolutely nothing like the image on Overstock.com. For one thing, there is no gold on this rug! It is a beautiful mid-level navy with light beige and taupe. There is a tiny amount of soft olive and burgandy with give it a little pop. It is an elegant rug, and looks stunning in my true log cabin in the mountains...but it would also look great in a formal library in an expensive upscale house. But you didn’t. And guess what nobody could tell. I put this rug into a multi million dollar home and honestly is just as good if not better than these other heavier rugs the have in their home. And in a year when they destroy it from their dogs, kids, and abuse they will have lot only hundreds compared to thousands. This rug is amazing quality and you won’t be disappointed. This beautiful rug graces our front entry hall. It is elegant and colorful while feeling understated and classic at the same time. Even our dog thinks it's the best place to be in our home!